Dimitris Mitropanos died today. He was one of the greatest singers of Greek demotic music. 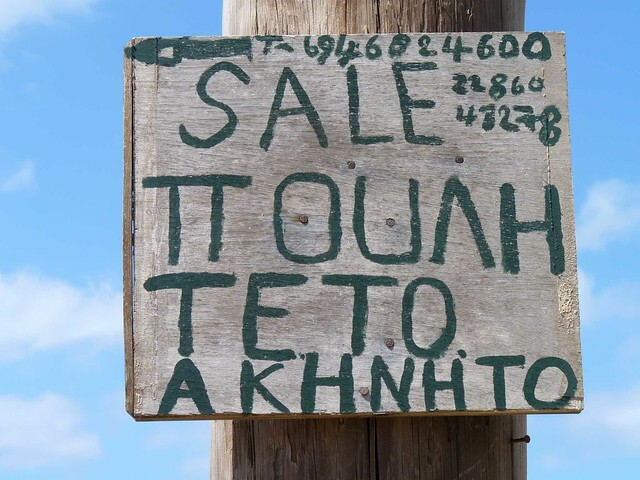 I haven’t talked much about how I learned Greek. Those who read regularly will know that I am fluent in Greek and translate professionally. But that wasn’t always the case. When I was 17 years old, I heard Greek spoken for the first time, in a Greek film. I started taking daily Greek classes when I was 18, but it took many years of hard work to learn the language fluently. One of the best things I did was to start listening to Greek music. 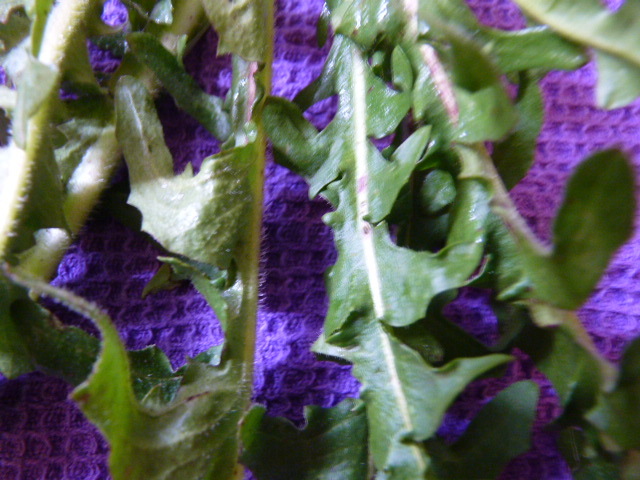 In fact, by the time I was 19 and until I met S, a classical musician, I only ever listened to Greek music. I would look up the words in my Greek-English dictionary and sift through my Greek textbooks to figure out the grammar (which was usually straightforward), and sing along in my very untrained way; Greek songs formed the backdrop of my life for a decade. Greek music of every type contributed more than any other one element – even more than the classes I took every single day for years – to learning the language. From the very beginning, Dimitris Mitropanos was my favorite singer. Back in those days, you couldn’t just download songs off the internet, so I made trips to New York City to buy his CDs from the Greek Music & Video shop in Astoria. When I went to Greece, I never went home without at least 20 new CDs. I even had cassettes of Greek music! As the years passed, I matured beyond the silly Greek pop music that was the soundtrack to my junior year abroad in Athens, but I never stopped listening to Mitropanos. His songs are mostly sad love songs, mostly stories of being hurt but still loving. I can’t remember a single time of personal despair in my 20s that wasn’t somehow soothed by his voice. I consider myself very lucky that I saw Mitropanos perform live, though only once. He played a concert in an outdoor theater in Thessaloniki in 2008, and I was thrilled to be there. 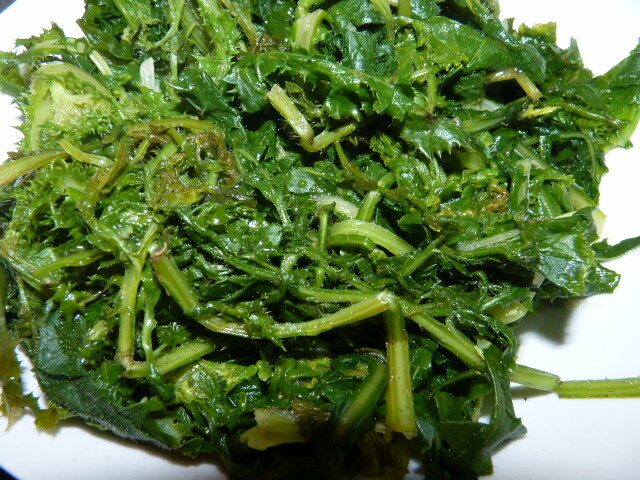 S always teased me for my Mitropanos addiction. When I would insist on playing his CDs in the car, S would point out where his voice went off key (constantly according to S), and would always put up a fight when I tried to switch from Bach or Tchaikovsky (S’s two faves) to Mitropanos. But even my diehard classical musician can and does appreciate the soulfulness and special vocal color to his voice. Despite a long battle with kidney failure, he continued to perform right up until his death of a heart attack at the age of 64. Although his death was premature, he left behind a massive discography and the legend of one of the most unforgettable modern Greek voices. Here are a few of his perhaps not quite so famous songs but among my personal favorites, translated by me. to how many mistakes am I still indebted? to the deeper reaches of the soul, to the further stretches of the mind. they left no more than a single day’s cigarettes. an empty bottle in their lives. and in my hands the days are fresh snow. I still have one hope, one hope that is my salvation. they lead me out of my way and through the darkness, softly leave a knife in my hands. may your wild rose wilt with drunkenness; I will cut off your head to marry it. because what can I possibly do with this life? In the chill of prison, find a heart to hold on. Where are you going in the thorns and loving? And I lose you more and more. lest I fall to sadness. and let me slip away. the thought of you will become a nail, and pin me to it. and black trousers of your son. All my life without meaning, my cousin, my cousin of death. Let it be that I should die Saturday at daybreak. Tonight the neighborhood weeps, together with my heart. Where are you, my sweet love, to see my tears? All my life without meaning, a lie, a great lie. And your suffering… where will it lead me? A few more great songs: Akou (Listen), To have my revenge on you (Mitropanos sings second), You want, Nikoli Nikoli. I didn’t take any of these photos, as I’ve never been to Chios. They are all by Giannis Misetzis, local politician in Chios and photographer. Today I thought I’d share something special with you – by way of a film review. The film is not new: it came out in 1999 and played in a few theaters in Athens for a few weeks. It received awards but soon disappeared from theaters; it never played much outside Greece as far as I know. It became my favorite film as soon as I saw it nine years ago, and remains so to this day. The English title is The Spring Gathering of the Field Guards (in Greek, I earini synaksis ton agrofylakon / Η εαρινή σύναξις των αγροφυλάκων), directed by the actor (and sometimes director) Dimos Avdeliodis, a Chian. The film is set in 1960, in the countryside of the large Greek island of Chios. The village of Tholopotami (which means ‘river of cloudy water’ in Greek) is a small, anarchic village gathered in a clump on a hillside, surrounded by fields of olive trees, wheat, and small gardens. The village of Tholopotami. Photograph by Giannis Misetzis. As the film opens, Kolokithias, the field guard assigned to Tholopotami, keels over dead from a heart attack while chasing Elisso, a young orphaned girl who lives with her aged grandmother, Kyra Vasiliko. Although they have an old crumbling stone house and a horse, they have no field or garden of their own, and no income; they survive by digging up a few potatoes on the sly, or plucking a few fruits from a tree along the road. Although Kyra Vasiliko tries to limit Elisso’s stealing to the food they need to survive, a field carpeted with bright red tulips catches her eye and she stops to pick a few. Kolokithias, who has been following them in order to catch them at their thieving ways, chases after her, but a heart attack strikes him down and he dies in the tulip field. The field of the tulips at Tholopotami. Photograph by Giannis Misetzis. 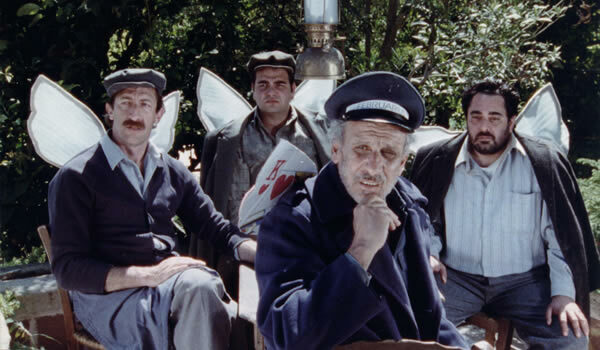 The death of Kolokithias at the height of spring, 1960, ushers in a year of upheaval as the village council requests a field guard be sent from Keramoti, but no one is willing to go; Tholopotami offers to pay half again the regular salary, and four men are found from among the agrofylakes who are willing to go. 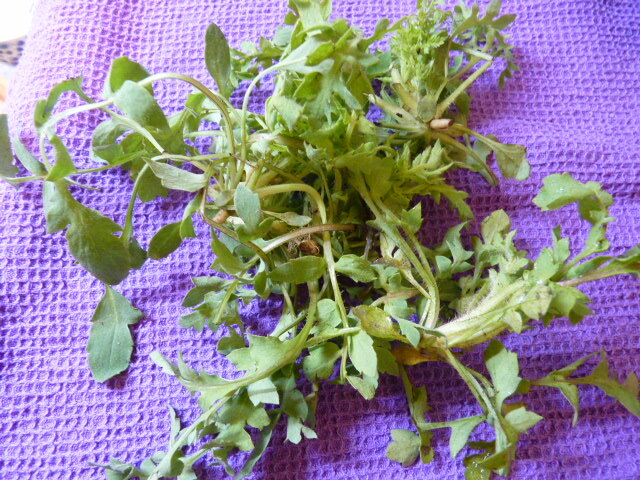 The first one is sent at the beginning of summer. He is undone by his gullibility: the villagers crash his motorbike and ‘save’ him, but he thinks it was an accident; as a result, he finds himself guarding only one small garden of 53 watermelons for the man who ‘saved’ him. When the Agrofylaki finds out, he is told to make an arrest or lose his job; desperate to arrest someone, he follows Elisso as she goes swimming in the sea. When he falls from the tree where he’s spying on her and lands on a beehive, he’s driven into the sea by the bees, and Tholopotami is again left without a field guard. The remains of the Catholic church of Agios Ioannis (St. John) in Tholopotami, a central point of the action in the film. Photograph by Giannis Mesitzis. The second man is sent as autumn comes to Tholopotami with torrential rains. Aware of the fate of the last two field guards, he decides to frighten the villagers, figuring that if they’re afraid of him, he will be able to control them; but his own aggressiveness is his downfall, as he marches the boys of the village, whom he has caught stealing oranges on their way to school, all the way to Keramoti to the Agrofylaki. After a dressing down by the head of the Agrofylaki, where he’s told that “these boys walk 8 kilometers to school every morning just to learn to read and write, and you drag them here for stealing an orange?” – and just like that, he loses his job. The third man is sent to the village in the winter. Careful not to fall into the trap of the previous field guard, he treats the locals as friends, and quickly worms his way into a group of men who play cards together. Betting with money was illegal so they did it secretly. The field guard is a terrible player and manages to gamble away all his money and possessions and even a borrowed donkey. Finally he is caught by the regular police and hauled off to jail, and thus ends the service of the third field guard. 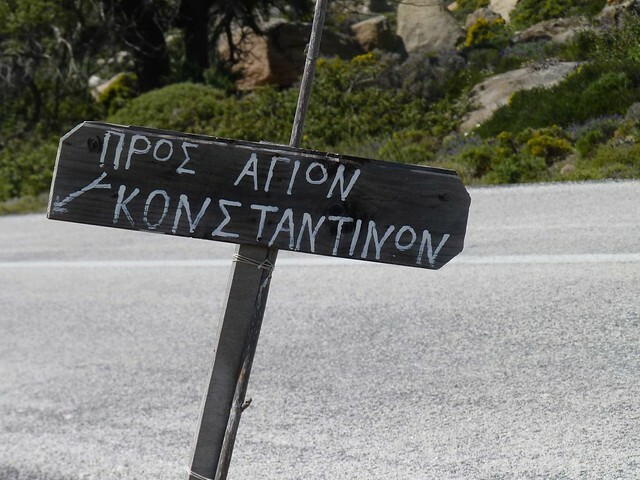 The fourth and final man is sent to Tholopotami just as spring comes again to the village. Unlike the others, he is young, fresh from the army; his playfulness and spirit put him at odds with the Agrofylaki, but he tries his best to catch Elisso as well. As he chases her through the fields, she slips on a cliff and loses her shoe; although he has to abandon the chase, he catches her shoe and keeps it. When his conscience works on him, he returns the shoe, ignores some of the excessive duties placed on him by the Agrofylaki, happily gives up his position, and chases Elisso off into the tulips where, this time, she lets herself be caught. Disused Catholic church of Tholopotami. Photograph by Giannis Misetzis. Is this series of guards – the first useless due to taking bribes in a clientilist system; the second a harsh dictator; the third a toady who throws away public money; and the fourth, a populist who throws his lot in with the people – supposed to represent four periods of recent Greek history? Or perhaps they are the three great human failings: fear, violence, greed; overcome by love. The film’s music is roughly split between the Four Seasons of Verdi and the natural sounds of the Chian countryside, with a little local music. The Four Seasons play perfectly with the changing nature of the village and countryside, and the varying natures of each of the field guards. The film avoids oversentimentality – the death of Kyra Vasiliko doesn’t feature at all; we see her in bed; Elisso is simply alone thereafter. Even the loneliness and desperation of the winter guard is shown without excess. The only overt emotion we see is when Elisso falls to the ground sobbing after losing her irreplaceable shoe – a reminder of what life was like in Greece not long ago, and may be again; growing up, my father in law never wore shoes except on special occasions, and all boys wore shorts year round as fabric was too expensive. 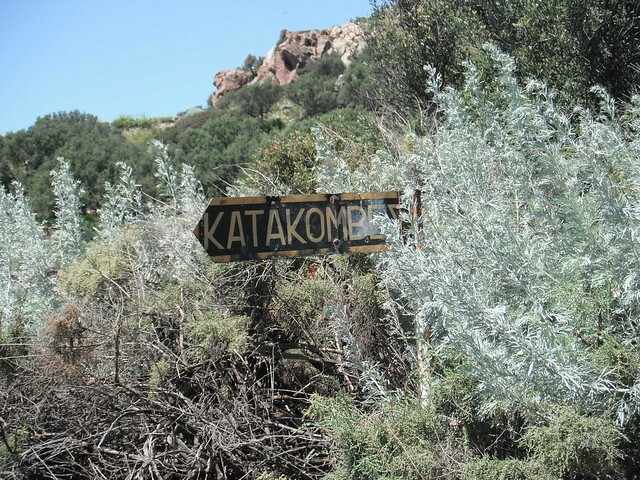 The magic of the countryside is such that the appearance of the ghost of Kolokithias – while terrifying or unsettling – doesn’t seem particularly hard to believe. When I first saw the film in 2003, I was taken by the nobility of destitute Elisso, who silently demands respect and whose ethic doesn’t require an apology for stealing a few potatoes from a landowner. When I saw it again in 2009, I was taken by the cyclical nature of the film: the seasons, the Four Seasons, the death of Kyra Vasiliko and the blossoming of Elisso – I had spent enough time on the islands to understand that life there is entirely cyclical. When I saw it again last night, I was taken by the severity and hopelessness of life for the public servants who were sent to perform an impossible job with no resources in a place utterly empty of family, friendly faces, a newspaper, a radio – a place which tried to thwart them and even threatened their lives. The summer guard tried to fill the void with his beloved dog; the autumn guard by being overzealous in his job; the winter guard with the friends to whom he gambled away everything he owned and eventually his freedom; and the spring guard with love – only the last was successful, or so one hopes. With each of those viewings, I was affected by a different aspect of the film because of my own life at the time: in 2003, I identified with lonely Elisso; in 2009, I identified with the island itself; and now I identify with the struggling public servant thrown into a bizarre and hopeless situation, and then held responsible when it inevitably fails. Every time, the cinematography and music held me spellbound for the entire three hours of the film. 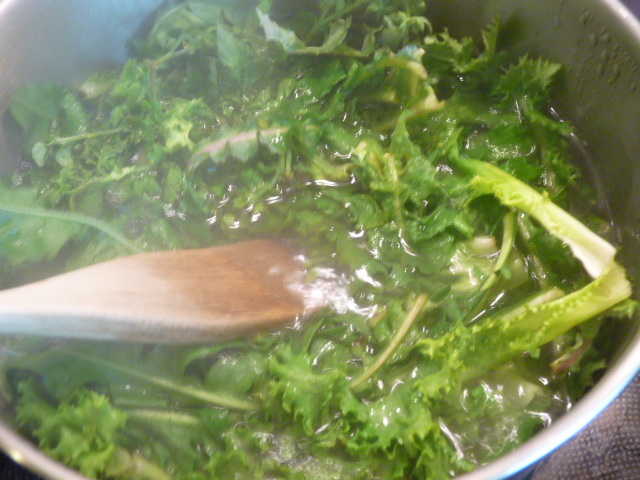 Α still shot from the film. If you’ve seen it, or have a chance to watch the film, I’d love to hear your thoughts. I bought my DVD of it at the Mastiha Shop, a chain of stores in Greece (including the Athens Airport) that sells products from Chios. The DVD has English subtitles. You can also watch it online here, although there are no subtitles. Coffee in Greece is a big deal. If you believe in the culture dichotomy of ‘beer cultures’ and ‘coffee cultures,’ Greece is very definitely a coffee culture. 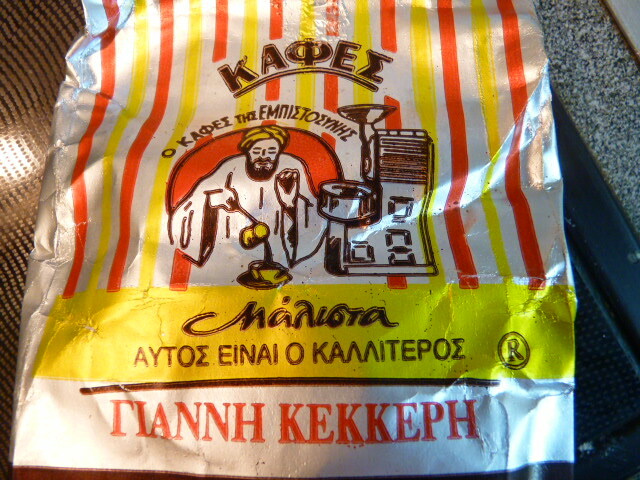 Cafes take two major forms in Greece: the kafeneio, or traditional coffee house, and the kafeteria, or the modern cafe. Greece is full of both. The kafeneio has traditionally been the haunt of Greek men, and lately, older Greek men, but you will often find women working there. Despite new legislation that makes smoking illegal in all indoor public use spaces, including cafes, most kafeneia are smoky. They usually have minimal decoration, simple tables and chairs, and sometimes a stack of backgammon boards. This is where retired men retreat to read the newspaper, drink their coffee, and talk about whatever it is that retired men talk about. The menu is usually made up of various kinds of coffee, soft drinks, some alcoholic drinks, and you can usually get something to eat as well (along the lines of some toasted bread with cheese). The kafeteria is a cafe with comfortable chairs, a menu with usually a variety of coffees, sweets, often ice cream, sometimes food like club sandwiches, soft drinks, alcoholic drinks, and so on. Everyone goes to kafeterias. 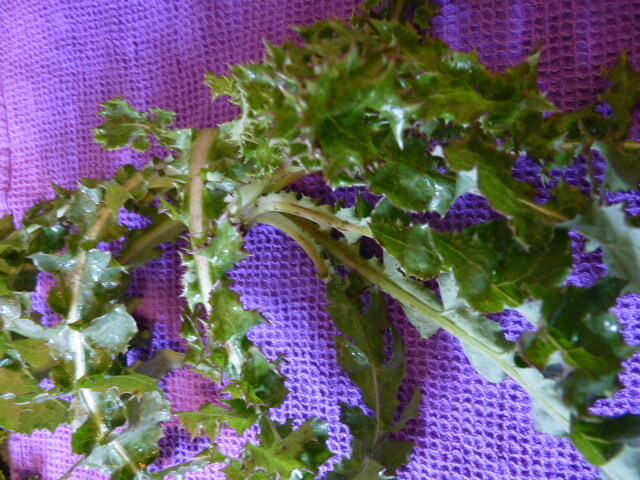 Both types are ubiquitous in Greece. 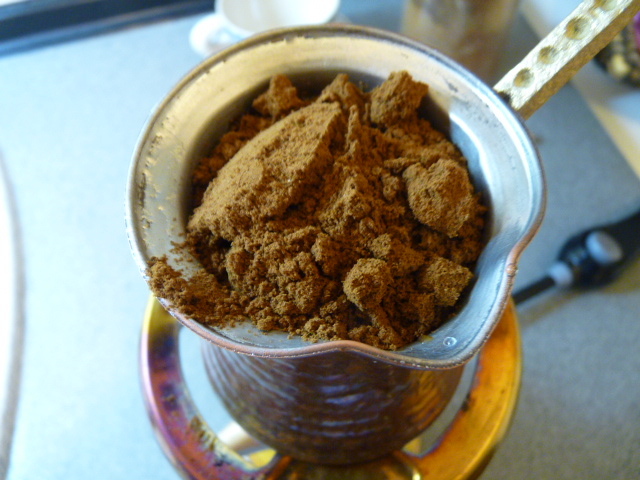 A popular coffee to order at either place, or to make yourself at home, is Greek coffee, or ellinikos kafes in Greek. 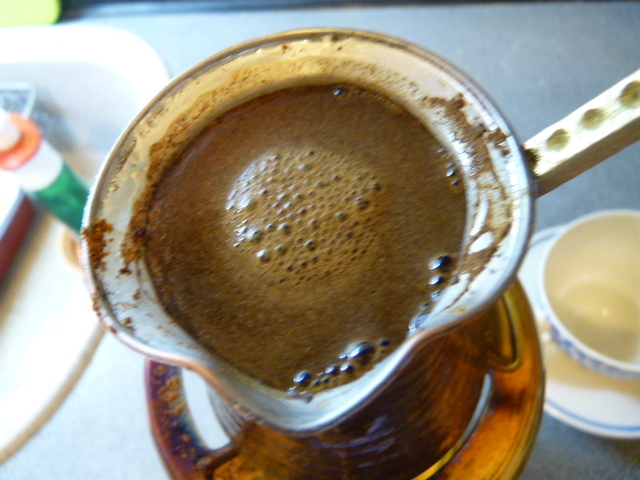 In Turkey, the exact same coffee is called Turkish coffee; in Cyprus, Cypriot coffee; in Bulgaria, Bulgarian coffee. I haven’t been to any other countries in the area, but it wouldn’t surprise me if this is a trend. The good thing about this coffee is that it takes very little in the way of equipment to make. 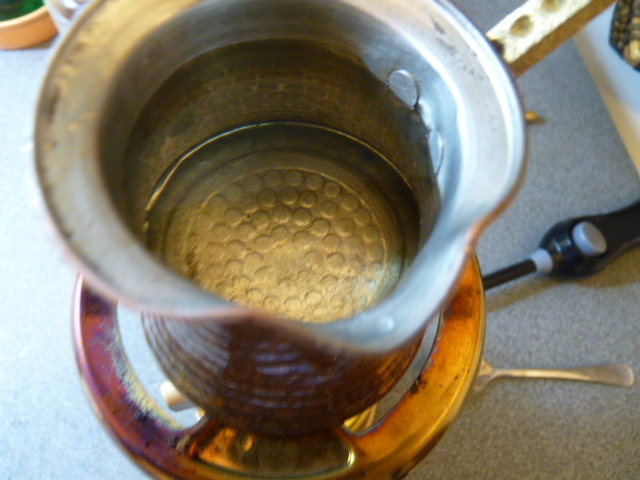 No need for a source of electricity, a filter coffee maker (or filters for that matter), a percolator, or an espresso maker. All you need is some source of heat (fire, cooking gas, electricity, etc. 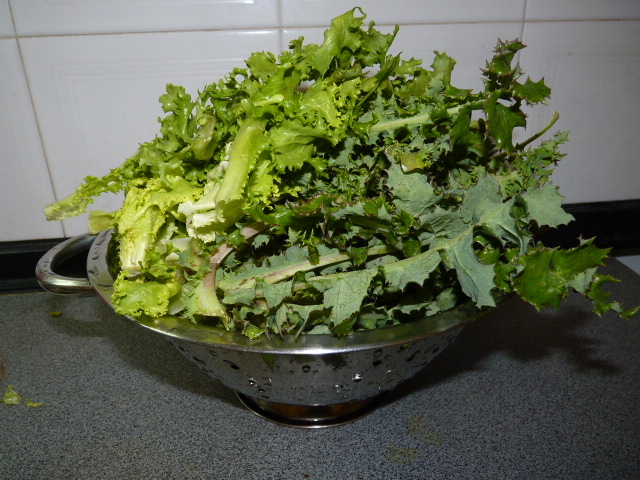 ), a pot to cook it in, some clean water, and a cup. 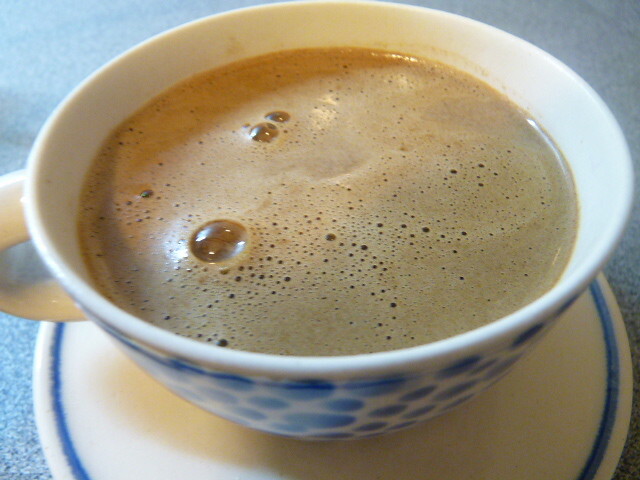 I don’t drink Greek coffee but S does. There are several ways to make the coffee. 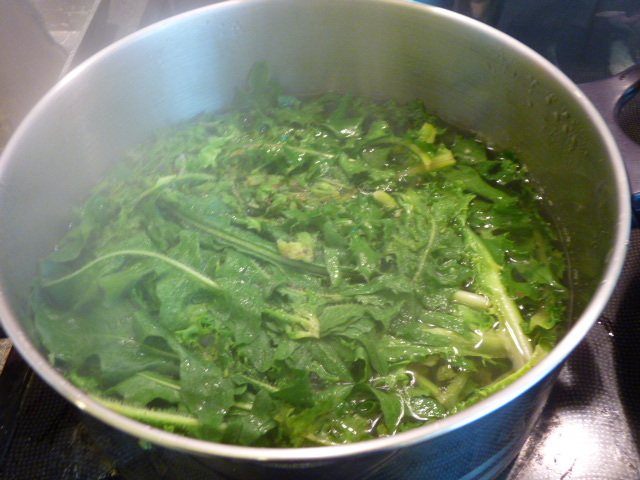 The most ‘authentic’ way is probably the method called hovoli. Hovoli uses a tray with sand set over hot coals. The sand is hot from the coals; the coffee pot is set well into the sand. This is hard to pull off at home, but many cafes do it this way. 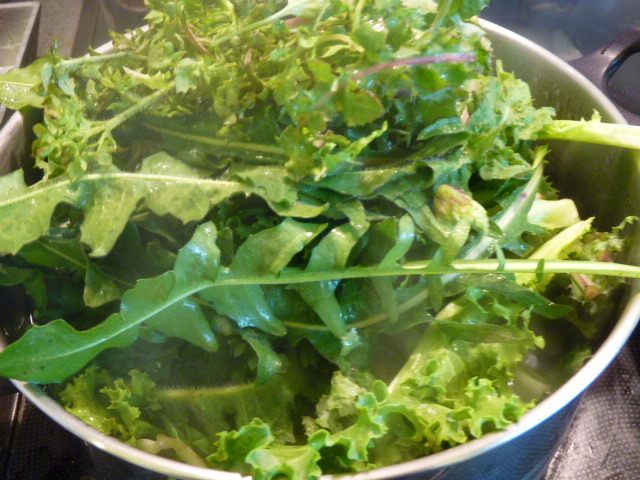 I make it using cooking gas. The coffee pot I use is made of copper and is specifically intended for this purpose. 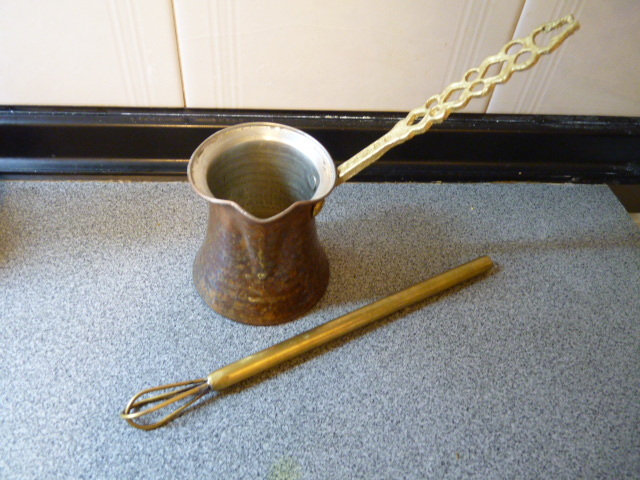 The small coffee pot is called a briki. 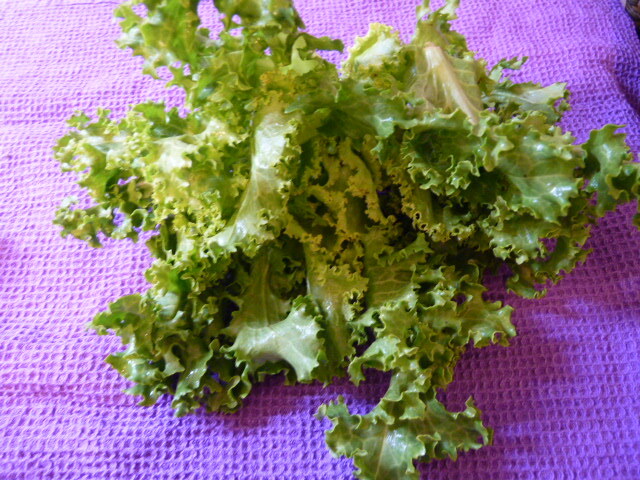 You can find them for sale all over this part of the world, and at all Mediterranean and Middle Eastern markets in the rest of the world. 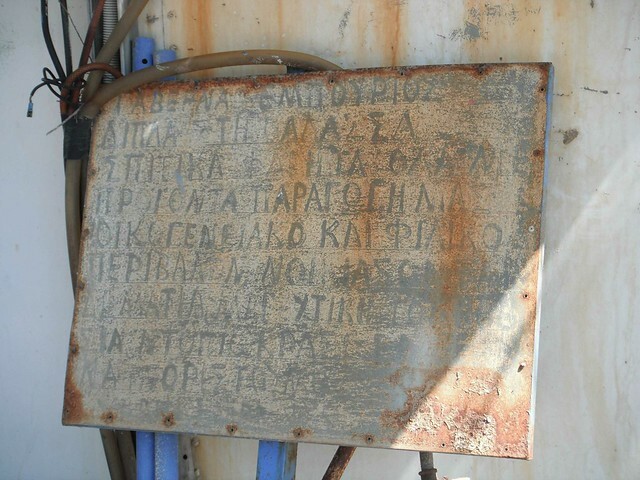 This one is from a copper worker in the city of Xanthi. It comes with a special stirrer which is made in such a way that the coffee can be stirred into the water without spilling. I suppose many parts of Greece claim to have the best Greek coffee; S is lucky because he prefers the coffee from right here in our town. 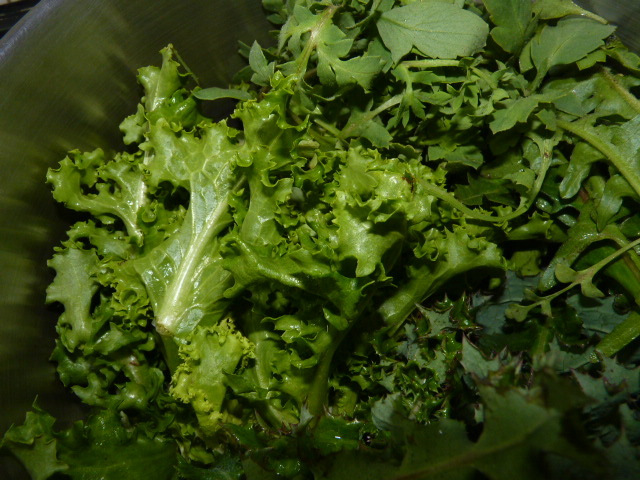 There are several kinds available; this is the standard type. 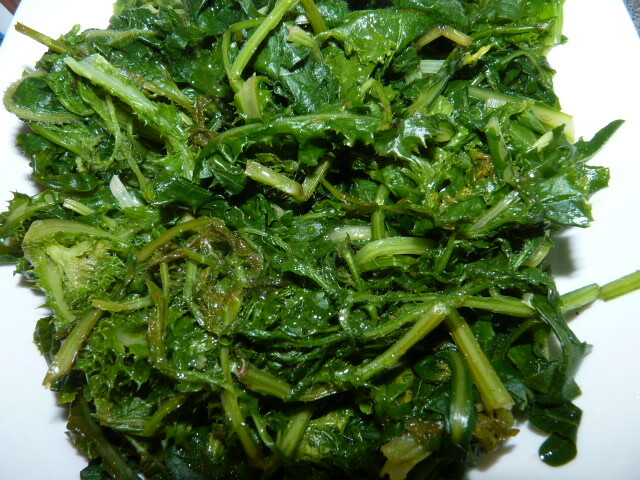 There is also a twice-roasted type which is black as ink, and which has a very strong flavor. 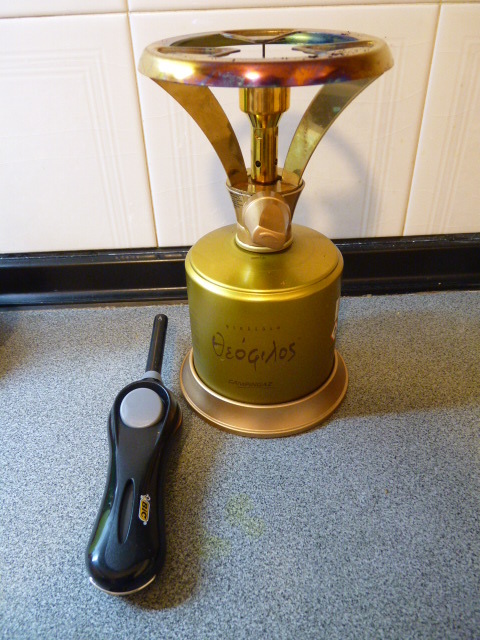 You can make Greek coffee in two sizes: single (monos) and double (diplos). S always drinks a double unless using the black type. A single uses one spoonful of coffee; a double two. 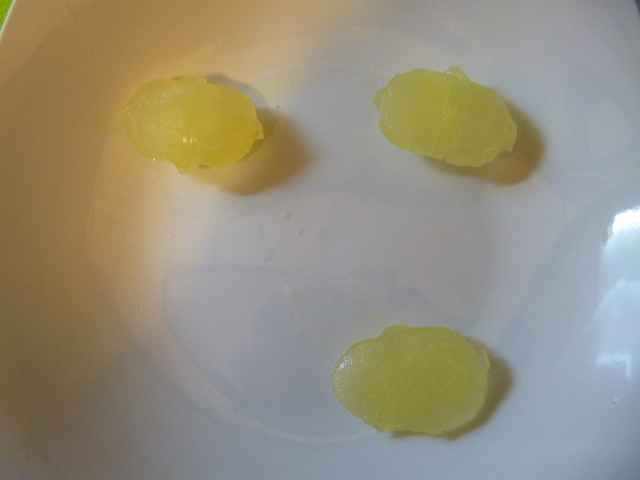 Put good filtered water in the briki a little below the rim. 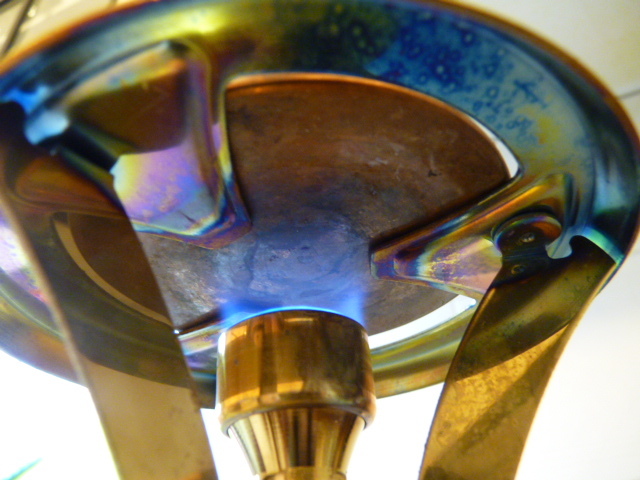 Turn on the gas (or whatever you’re using) and set the briki on the heat source. Spoon the coffee into the briki and stir with the special stirrer until it’s completely incorporated. If you will want your coffee with sugar, add the sugar at the same time that you add the coffee. Sugar is not added to this coffee at the table! Leave it alone for a few minutes – but don’t leave the room. It needs to be babysat carefully because when it’s ready, it must be removed immediately from the heat; otherwise, it will basically explode all over the place, and that is a major pain (I know, it’s happened to me three times). 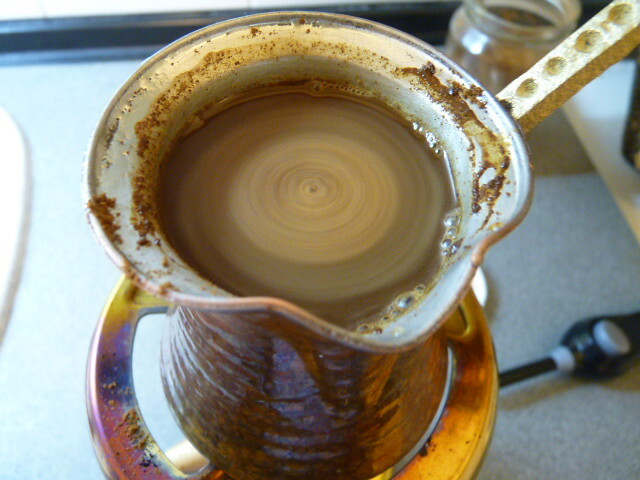 When it is ready, you will see the coffee at the edges of the pot, usually on one side (in the photos, note the difference in the upper left side of the second photo), start to swell, and this swollen coffee will start to advance toward the center of the briki. Once this starts to happen, you have only a few seconds to remove the briki from the flame and pour it into the coffee cup. If you take it off too soon, the coffee won’t have the nice foamy top, but if you wait too long, you’ll be scrubbing your kitchen for a while. To drink the coffee, let it sit on the table for several minutes – usually around ten minutes – to allow it both to cool and for the coffee grounds, which are floating in the coffee, to settle to the bottom of the cup. When you drink it, take small sips and don’t tip the cup back, in order to keep the coffee grounds at the bottom. Never drink the whole thing, and never stir the coffee. The grounds are not meant to be drunk. 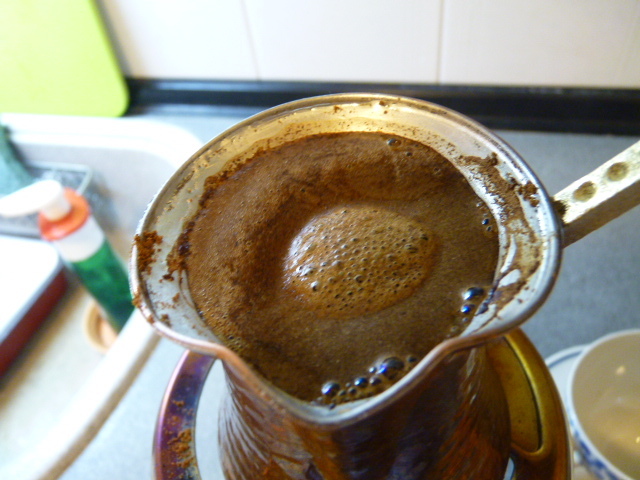 When you have drunk your coffee, there will be a sediment of coffee sludge at the bottom. 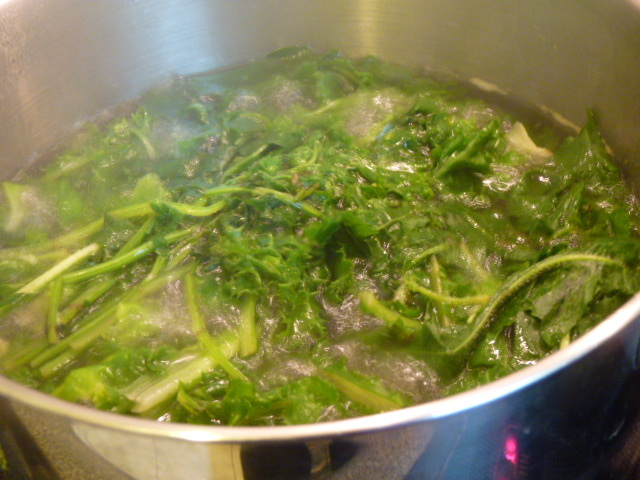 Discard that when you wash the cup. 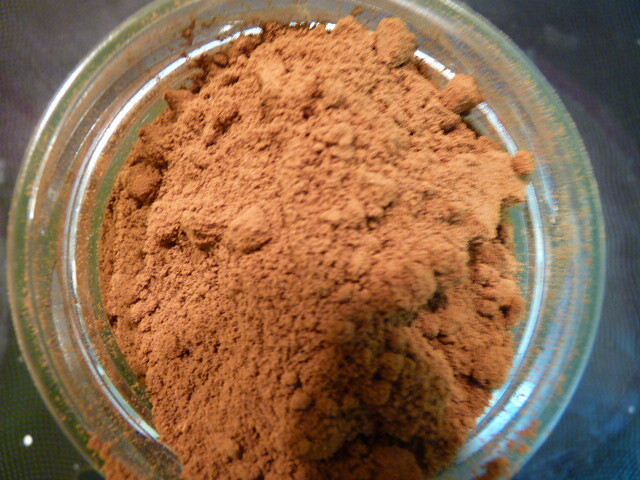 Some people believe that they can ‘tell the future’ based on these coffee grounds. The way it works – as far as I know, I’ve never done it – you drink your coffee, and then turn it upside down on the saucer. 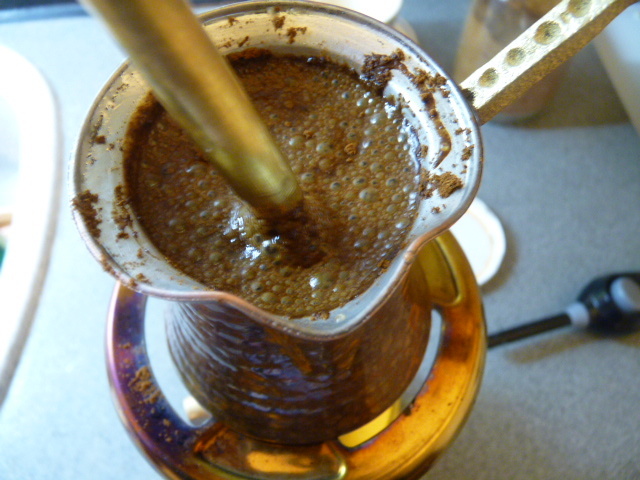 Then the ‘kafedzou’ (coffee reader) ‘reads’ the way the grounds look inside the cup. I suppose it’s in the same tradition as reading the internal organs of a sacrificial goat. 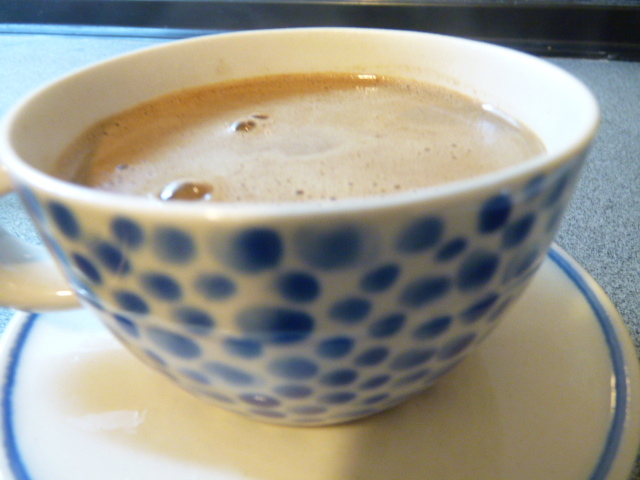 Note: the ceramic coffee cup and saucer were handcrafted by Lizbet Giouri, artist. 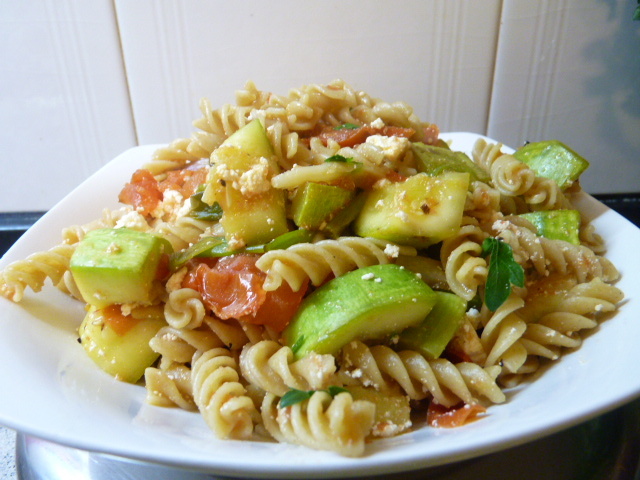 Her pieces are available on the island of Folegandros at the restaurant ‘Pounda,’ in Chora. A walk through the shops..
We already saw some signs I’ve collected on my ramblings around Greece. Here are some more. I’ll never get tired of these. 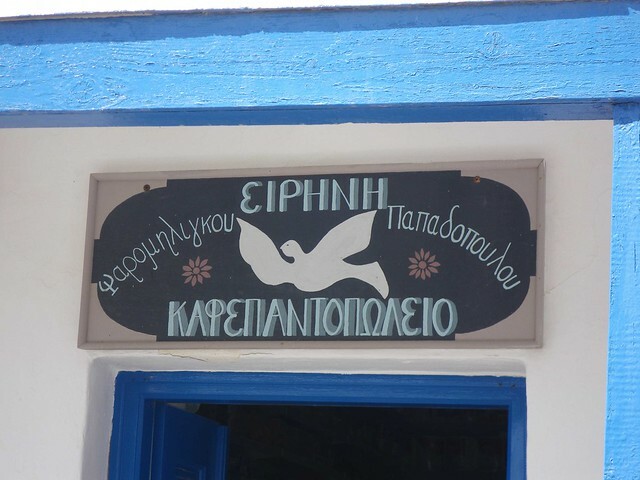 This sign directs you to the chapel of Agios (Saint) Konstantinos on the island of Milos. 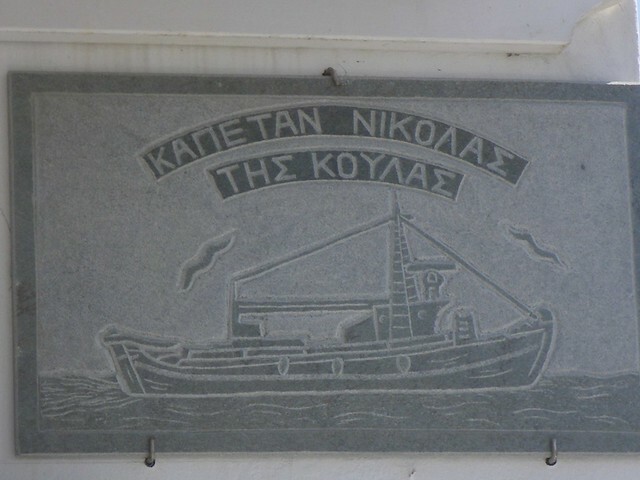 “Koula’s Captain Nikolas.” The name of a restaurant. 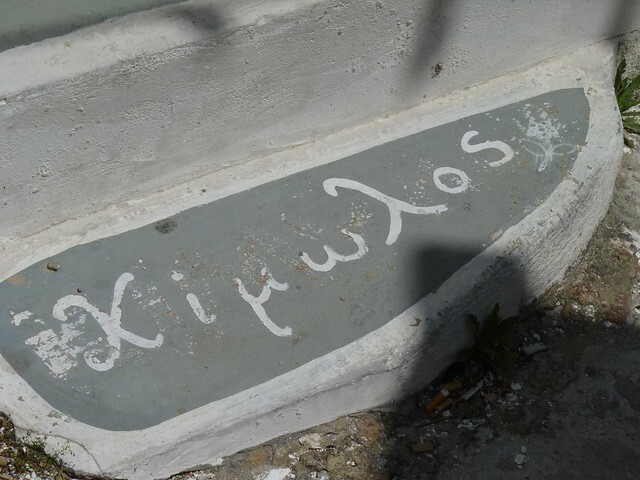 This step says “Kimolos,” the name of the island. 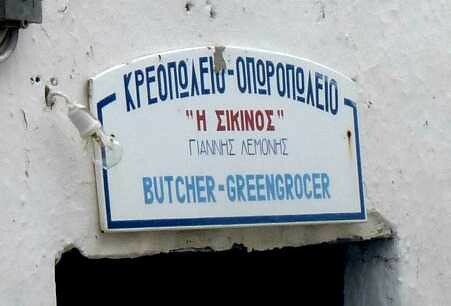 “Butcher – Green Grocer ‘Sikinos’, Giannis Lemonis.” From the island of Sikinos. 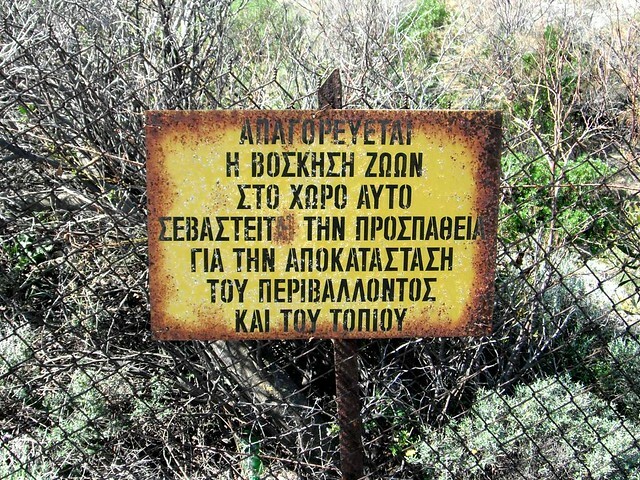 “Grazing of animals is forbidden in this area. 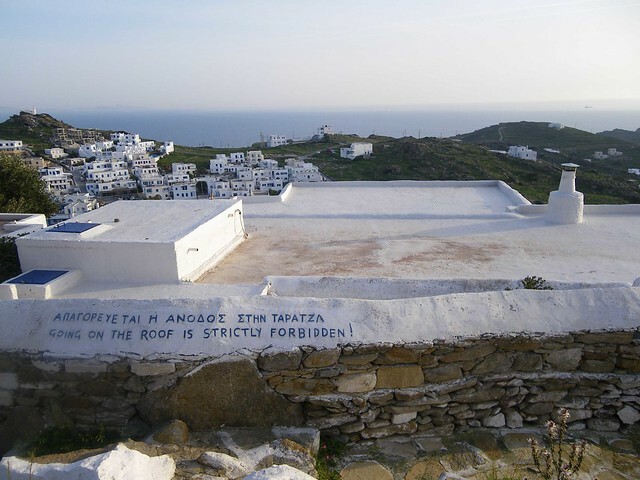 Respect the attempt to rehabilitate the environment and the landscape.” Near the beach of Achivadolimni in Milos. “My Klima, you are always in my heart. 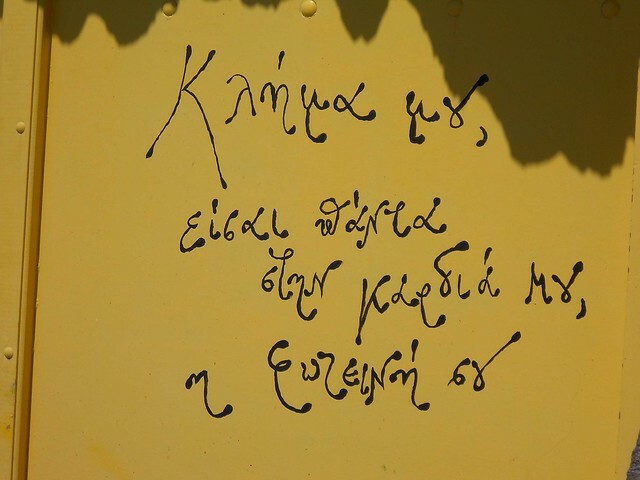 Your Foteini.” Klima is the name of the village where this is written; Foteini is a woman’s name. “Empourios… welcome! 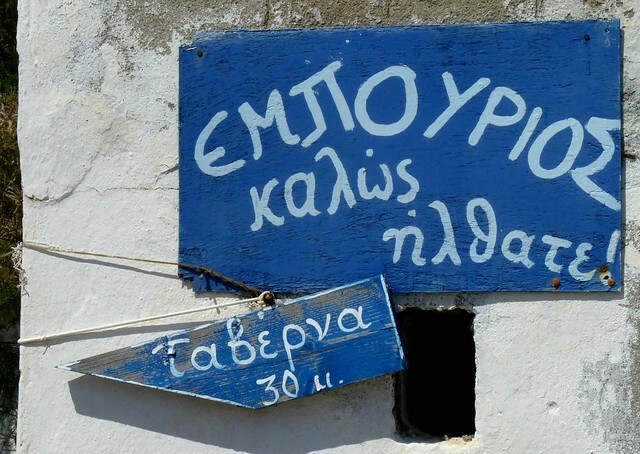 Taverna, 30 m.” From Milos. Why would someone have to write that? Oh… I get it now! 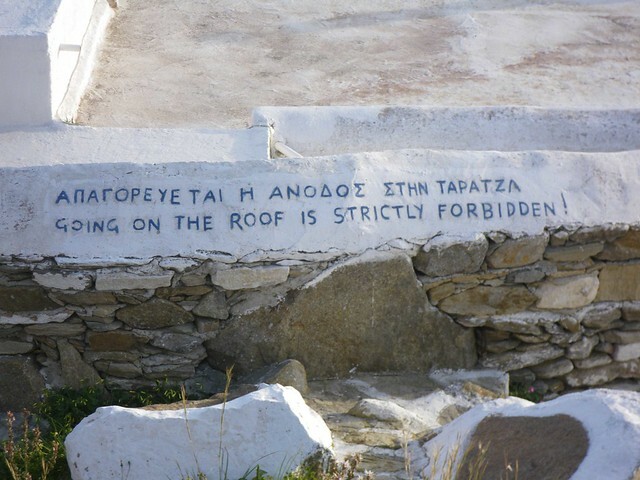 The sign directing you to the early Christian Catacombs in Milos. 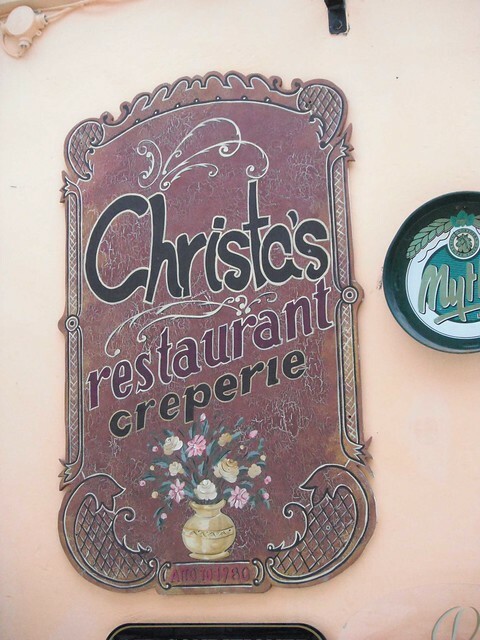 S’s favorite creperie in Kerkyra (Corfu) where he lived for seven years. I have no idea what this says, but it’s probably the name of the person who built the fountain that it’s attached to. It’s written in the graceful Turkish script that Turks used until the early 20th century when Atatürk introduced the Roman alphabet. 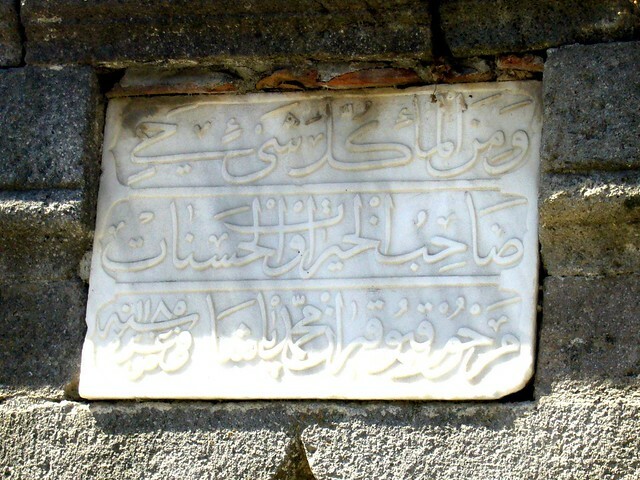 The inscription dates to the period of Ottoman occupation of Greece (pre-1821). 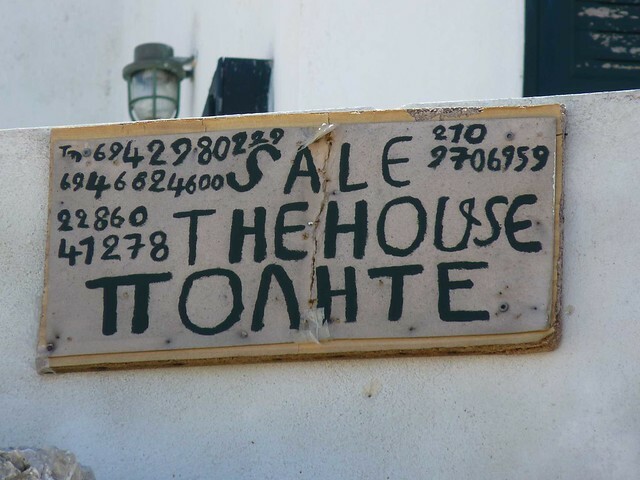 Both this sign and the one above it manage to misspell the Greek word for “for sale”, each in a different way. 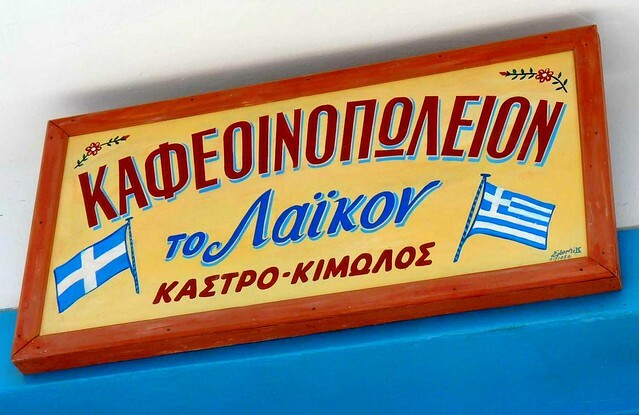 “Empourios Taverna, next to the sea, homemade food, all with traditional products, family-run and friendly environment…” it goes on but my eyes gave out. Remember to notice the little things in life!